Please Note - The game has updated - the manual is currently being updated. However, the in-game manual is up-to-date in the meanwhile. Please refer to that for all queries. 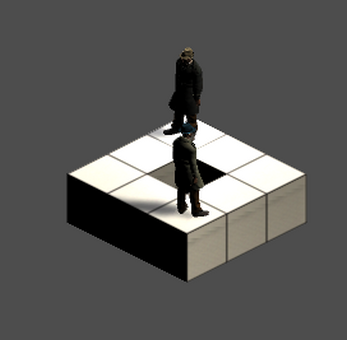 Double Crossroads is a game about two assassins hunting each other. They are getting directions from you - and you want them both dead. Hence, you are feeding them the same instruction - trying to get them to have a duel. If they have a duel, they both shoot each other off, taking to their graves your involvement. However, if one of them survives, he will find out it was you - and you lose. You are feeding them both the same instruction. They will turn to their respective left, right and move forward upon your instruction. However, it is possible for an instruction to be invalid for one or both of the assassins - in that case they will indicate it to be such. 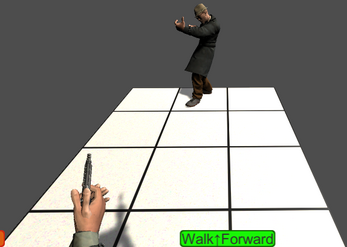 Use the on screen buttons (Turn Left, Turn Right, Walk) to control both the assassins simultaneously. There is also the Reset Button which allows you to reset the level to the initial state. The main menu button allows you to go back to the main menu. Keep in mind, your progress will be lost. The Camera button allows you to reposition the camera. It cycles through five camera locations - four each at the corners of the level, and lastly a top down view. This game is a prototype. As such, it may be unfinished, have issues etc. While care has been taken to ensure smooth operation of the game, the user assumes all responsibility for any issues that may arise with running the game. This game uses analytics - it is not meant to be played by children under 13 years of age. In case you do not wish to or cannot consent to participate in analytics data collection, do not play this game, and navigate away. You can create your own levels for Double Crossroads using a simple level creator. Levels are generated in the form of a string. Using this string, you can also share your created levels with friends and strangers alike to show off your level design skills. You can create a level by indicating the positions of the relevant items on a grid. Follow this guide to find out how to create the grid using characters. The first thing you need to do is to create the map on a grid/graph paper. You can use whatever notation you feel comfortable with, but I have used a shaded square to indicate hole and circles with arrows to indicate the location of the assassins and the direction they are facing. For this level, I won't be putting in any walls. However, if you choose to, you can indicate a wall by putting a 'W' sign in a square. Once you have created a level, it's time to get the coordinates. Starting from zero, number the rows and columns of the map. Let us take the third screenshot as an example (the one that looks like a square donut). Keep in mind, the coordinate system of the maps is zero-indexed, i.e. the first tile can be thought to occupy coordinates 0,0 . For Assassin 1, the values are 0 for looking at zero degree, 1 for looking at 90 degree, 2 for looking at 180 degree, 3 for looking at 270 degree. For Assassin 2, the values are 0 for looking at zero degree, 4 for looking at 90 degree, 8 for looking at 180 degree, 12 for looking at 270 degree. Keep in mind, there has to be a difference of 180 degrees between the two assassins, if you want to have a long distance duel. However, if both assassins will meet on the same tile (which is also a possible solution), then this need not be the case. 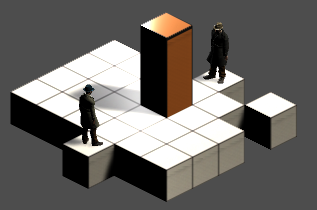 The next two characters are used to describe the total length and breadth of the level. Thus, for a map whose total grid length is 10 and breadth is 8, it can be mentioned as A8 (as A is code for 10). The next set of two coordinates are the position of the first assassin. Keep in mind, these are zero indexed. As such, it can be 00. The floor below the assassins is always assumed to be a valid, empty tile with no walls or holes in it. The next set of two coordinates are the position of the second assassin. As in the previous case, these are zero indexed. As such, it can be 00. The floor below the assassins is always assumed to be a valid, empty tile with no walls or holes in it. These are the coordinates of the walls. A map may not have walls - in that case proceed to have holes or tiles if need be. List muliple coordinates of walls here if need be. For example, let us say you have two walls in the map at (1,1) and (1,2). This part will read as 1112. This is an optional part - and is used as a switch to indicate the presence of floor tiles or holes. Let us say you want to place holes in the map. Now, if a map has more holes than floor tiles, it makes sense to just mention the floor tiles, as this will keep the string short. Mention the coordinates of the first Assassin to switch to floor mode (i.e. whatever you type next are floor tiles). Mention the coordinates of the second Assassin to switch to hole mode(i.e. whatever you type next are holes). Depending whether you mentioned the first or the second coordinates of assassins, these will be the position of holes or tiles. Hence, we arrive at the string for the map mentioned in the screenshot. Here, the first character D indicates the Assassin 1 is at an angle 0 degree and the other assassin is at an angle 180 degree (0+12). The following two characters (3 and 3) indicate that this is a grid of length 3 and breadth 3. The next two characters (00) indicate the position of the first assassin. The next two characters (22) indicate the position of the second assassin. Since there are no walls, we can ignore the part of the string used for walls. The next two characters (22) change the mode to hole mode. The next two characters mention the location of the only hole on the map. Let us take the last screnshot as an example. Two assassins, one at zero degree, the other at 180 degree (hence first character is D). Their locations are 0,2 and 5,2 respectively. The string for the above level is .